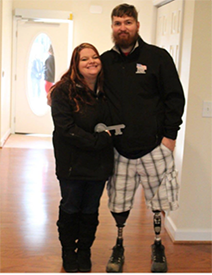 One thing that sets HFOT apart from other organizations is that we build where our Veterans want to live. Typically, they consider factors such as proximity to VA care, family support, and access to good schools for their children. Recent Home Recipients Autumn and Doug Harris, have found another benefit in their community of Romney, W.V. – thoughtful neighbors.